I took a teddy bear making course where we used recycled materials to make our bears last weekend. It was loads of fun, and surprisingly, a whole lot of hard work too! All the muscles in my hands were hurting and my poor fingers were pricked like pincushions by Sunday! Despite all the blood and sweat shed, it was a whole lot of fun to make something a bit different from what I usually do. It was also nice to simply sew with other people, I'm so used to my hermit ways at the workroom that I had forgotten how enjoyable crafting with others can be too. 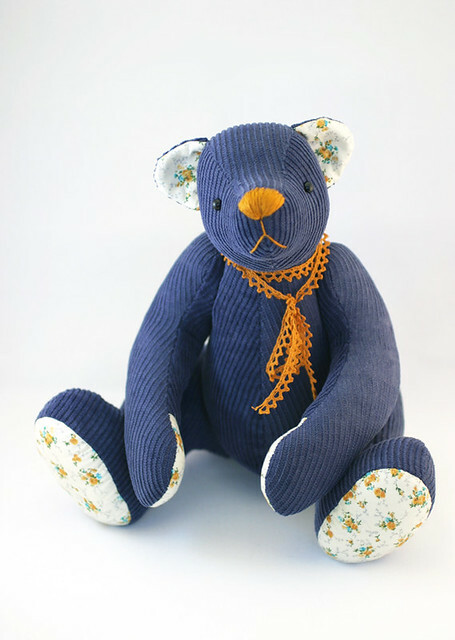 Bluebeary used to be my favourite pair of corduroy trousers that were so old and worn that they weren't even good for lounging around the house in anymore. I got them second-hand from a friend when I was in my 20's and I wore them a whole lot in school because they were so cute and comfortable. The last time I wore these trousers was when a good friend of mine had moved to live just down the street, and a bunch of us got together to paint her wall. This is why Bluebeary has a few little purple spots here and there. I like that all the memories attached to the trousers, along with a few new ones too, now live on in Bluebeary. Some days are dull and drab and grey. On days like that it's a struggle to simply get out of bed, and all you want to do is stay under the blanket and pretend that it's still summer. Grey days are filled with tea, blankets and comfort food. Other days are sunny and bright and full. On bright days you're full of joy and full of energy, and nothing is impossible. You have lots to do, you get lots done and you whistle while you work. Today has been a bright grey day. The morning was rainy and cloudy, and I slept late because it looked like the sun hadn't risen yet. 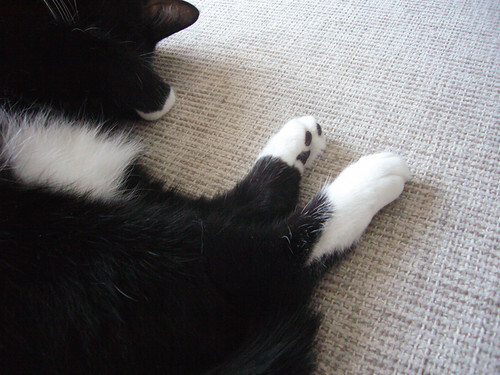 I sulked under my blanket for a bit, drinking tea and eating cookies. But then in the afternoon, the sun peeked from behind the clouds and the day, short as it was, took a turn for the better. I popped down to the workroom and got a bit of sewing done, and while I'm still feeling a bit blue, it's not so bad, really. It'll be blankets, tea and biscuits for the evening too. First of all, I'm happy to say that my Blog-more Month was a success! I managed to post once every week last month, just like I aimed to and I'm rather proud of myself for that. As I had hoped, blogging more inspired me to do more, and doing more made me feel better and happier, even though it's getting rainier and all together bleaker now that we're at that awkward time between autumn and winter. One of the things I got done is Grace the rag-bear. I started Grace a while back, but she was forgotten in all the Blog-more and Halloween hub-bub and I only got around to finishing her now. Grace knits a lot, so much so that she even knits and purls in her sleep! Grace is wearing a blue flowery cotton dress with a white Peter Pan collar and mis-matched red buttons down the bodice. She's also sporting a knitted, warm orange wool scarf. 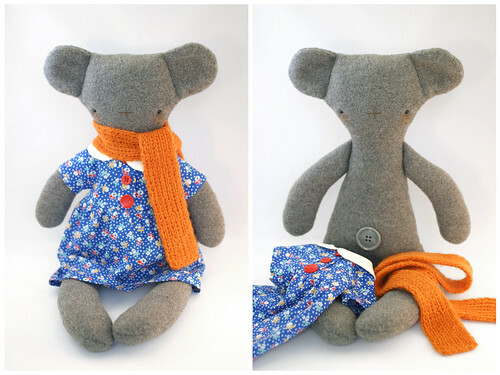 Grace is made out of grey wool and she has safety eyes, an embroidered nose and blushy cheeks. She has a grey plastic button for a belly button. The yarn for Grace's scarf was dyed by my grandmother, using -if I remember right- onion skins. Gran used to dye yarn in a big, black cauldron by the lake using natural dyes. 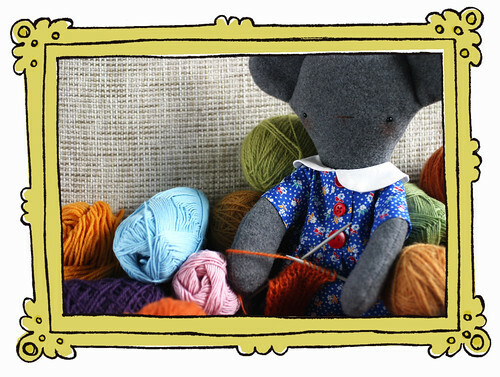 Grace herself was inspired by my mum, who knits all the time, and who's super good at it too. I'm sadly nowhere near as good at knitting as my mum is, and the most I can manage to knit is slightly irregular scarves. I hope to keep on blogging more and doing more in the months to come too, it seems to be a good deterrent for the winter blues that tend to strike me down once the days get short and sunlight becomes rare.